Krishna ashtami is observed on the 8thday of the waning moon of sravana masa (month) in which Rohini Nakshatra(star) is ascending. 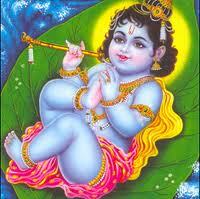 It is on this day that lord Krishna was born and it is a big festival in India. On this day in south India people draw foot prints into their houses, as if lord Krishnahimself as a child has entered the house. It is popularly known as Janmashtami in Mumbai and Pune. It is celebrated by breaking the pot with butter milk called Dahi Handi. All the men form a human pyramid and the person at the top breaks the pot with a coconut. In Madhura and Gokul people celebrate this festival with joy. The Rasa lila of lord Krishna is enacted as a part of the festival. During Krishna Ashtami kite flying is an important event in Kashmir.